Following the last two last year’s huge successes, Bristol’s award-winning micro chain The Better Food Company, based in St Werburghs and on Whiteladies Road, are again challenging the way conventional farmers are breeding turkeys for Christmas. By rearing their own naturally bred organic turkeys, The Better Food Company is leading the way in raising animal welfare. These turkeys are different. 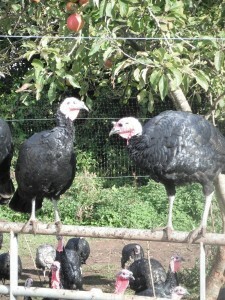 Unlike 99% of commercially reared turkeys they breed naturally, mating in the spring and producing fertile eggs that are hatched later in the season. For other turkeys, artificial insemination has become the norm – an increasing demand for unnatural amounts of breast meat has altered their shape to the extent that they can’t mate or breed naturally. They have their wings and beaks clipped and are often lame. For a shocking video insight into commercial turkey breeding, watch this video on YouTube. “We haven’t been happy with the way the turkey industry has been developing over recent years, and as we’ve been unable to find a local, organic turkey farmer who could do it our way the only solution was to do it ourselves,” says Phil Haughton, The Better Food Company’s managing director. For some months now, in an old cider orchard deep in rural Somerset, Phil’s Norfolk Black turkeys have been roaming free, “flying into the trees, enjoying the mad British weather and picking apples off the branches,” says Phil. The Better Food Company has a long history of offering local and organically produced food at affordable prices. This year they are continuing with their mission to provide all you need for your festive celebrations from the surrounding local area including veg grown at The Community Farm in Chew Magna, whilst maintaining their renowned rigorous standards and high quality.